Oni is a third-person action game developed by Bungie West, a division of Bungie. Released in 2001, it was Bungie West's only game. It broke new ground by blending third-person shooting with hand-to-hand combat, resulting in a unique, yet familiar game for third-person shooter enthusiasts. In 1999, while still in development, Oni won the Game Critics Awards for Best Action/Adventure Game. Due to difficulties in debugging and the general unplayability of a fighting game over any less reliable network than a LAN at the time, multiplayer was omitted from the released version. The game's universe is heavily influenced by Masamune Shirow's manga series Ghost in the Shell. The main characters Konoko and Commander Griffin look similar to Shirow's protagonists Motoko Kusanagi and Daisuke Aramaki. 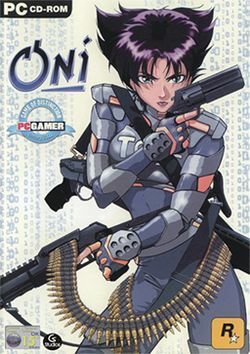 Dark Horse Comics published a comic-book version of Oni as a four-issue limited series, the first issue of which was bundled with the Windows version of the game. The action of Oni takes place around the year 2032. The game world is a dystopia, an Earth so polluted that little of it remains habitable. To solve unspecified international economic crises, all nations have combined into a single entity, the World Coalition Government. The government is Orwellian, telling the populace that what are actually dangerously toxic regions are wilderness preserves, and using the Technological Crimes Task Force, its secret police, to spy on citizens and suppress opposition. The player character, code-named Konoko (voiced by Amanda Winn-Lee), full name later given as Mai Hasegawa, begins the game working for the police. Soon, she learns her employers have been keeping secrets about her past from her. She turns against them as she embarks on a quest of self-discovery. The player learns more about her family and origins while battling both the Technological Crimes Task Force and its greatest enemy, the equally monolithic criminal organization called the Syndicate. In the game's climax, Konoko discovers a Syndicate plan to cause the Atmospheric Conversion Centers, air-treatment plants necessary to keep most of the world's population alive, to catastrophically malfunction. She is partially successful in thwarting the plot, saving a portion of humanity. This page was last edited on 16 August 2016, at 17:38.